They're doing this because they've gone the route of less expensive production methods by using vegetable oil instead of cocoa butter. 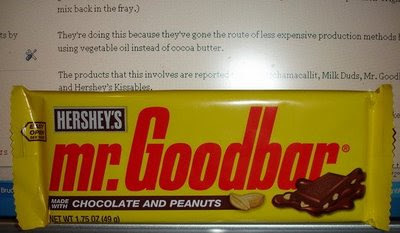 The products that this involves are reported to be Whatchamacallit, Milk Duds, Mr. Goodbar and Hershey’s Kissables. Despite the labeling reflecting the changes, folks are saying that the products look just like they did, but with the one ingredient change and reference to the product now being a chocolate candy. Though I'm no chocolate sales expert, the items noted would seem to be items that aren't the bigger sellers. Regardless, it seems the subtle label changes seem to verge on the practice of sneaky. What did Hershey's expect in this day and age? One can't even fart without it getting blogged about and finally picked up by media on many levels. Hershey's defends itself by saying the packaging is clearly marked and this change is a cost saving measure. Despite the concerns of many, when some were put to a blind taste test of Kissables, 1/2 the taste testers liked the new version better. Hmm... that doesn't help the arguments against. I guess this makes it official, the economy is in a nosedive when our chocolate providers start swapping out key ingredients. So far Hershey’s Kisses, Reese’s Peanut Butter Cups and its classic chocolate bars are immune to the substitution and that's good because when you mess with my fave, (Reese's), then I go to war! Or as I like to say, if you don't like it, speak with your wallet and write letters. Letter writing has worked. It convinced them to put Almond Joy back to it's original formula.